February 20, 2018 – Let’s file this under business ideas we wish we had thought of. It’s all about location. 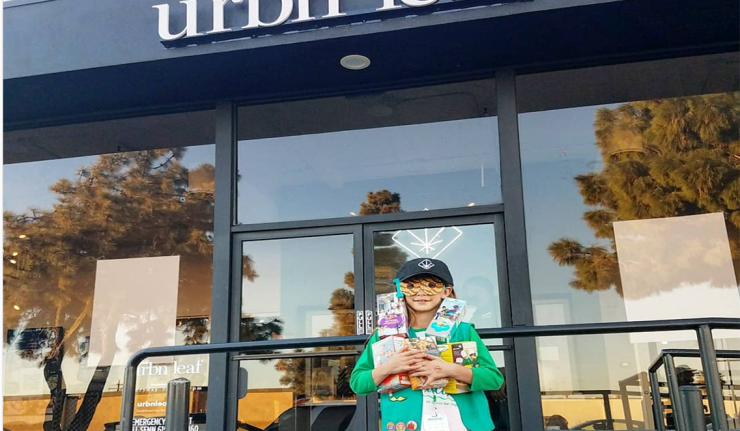 And a nine-year-old Girl Scout seemed to have hit on something as she set up shop outside the Urbn Leaf marijuana dispensary in San Diego this past weekend to sell cookies. Her father, who is protecting their identity, told KGTV- ABC 10, that she sold 312 boxes of cookies over a six hour period. It even included a photo of some of their weed with a box of Thin Mints and Tagalongs. One of their marijuana strains is called GSC–named after the Girl Scout cookies and known for its sweetness and earthiness. Comments to Urbn Leaf’s post were mixed, most supported the girl for being entrepreneurial, but some wondered if mixing a youth leadership organization and marijuana was problematic. Alison Bushan, Girl Scouts San Diego’s spokesperson, said selling cookies from a wagon on the sidewalk with her father and not from a booth directly outside the shop was not in any violation of their rules. “If that’s what they say they were doing… then they were right within the rules,” she told KGTV. And according to Fox News, Will Senn, Urbn Leaf’s founder, came to the girl’s defense. “Anytime we can help out by driving more people to support local fundraising like a Girl Scout selling cookies, we’ll do that,” Senn said. The story managed to get the attention of many national news outlets including The New York Times and USA Today. This isn’t the first time selling cookies near a dispensary made the news. The Los Angeles Times reported a story in 2014 where a Girl Scout sold cookies outside a dispensary in San Francisco. And similar stories appeared in 2016 about sales outside shops in Portland and Albuquerque.